Depending on which area of the UK (or a country) you’re planning to buy a holiday let in, you can soon discover that there’s quite a bit of competition out there for bookings in your chosen location. This means that, before you even get a chance to build up some 5* reviews and an online presence for your rental, you may end up struggling to stand out against nearby, long-established, ‘already popular’ holiday lets and Airbnb rentals. One way you can get ahead of your competitors – right off the bat – is to ensure that you purchase a property which is not only situated in a place where people want to stay, but one which has something quirky, unique or individual about it. With that in mind, we explore some factors you might want to keep ‘top of mind’ when you’re searching for a potential cottage or Airbnb rental which both stands out from the crowd and has the potential to attract year-round bookings. What type of unique property should you buy? A property which just looks a bit different? In today’s holiday rental market, it’s not uncommon to find unusual and unique places to stay for a short break or holiday. 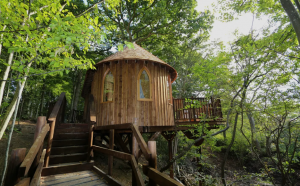 From treehouses and castles, to gypsy caravans, windmills and old airships – it seems like there really are unlimited possibilities these days when it comes to sourcing somewhere interesting to stay. Here are just a few examples of some interesting places you can rent right now in the UK. You’ll notice that they all carry a fairly hefty price tag when it comes to the cost of staying the night! This is another benefit of owning a unique holiday property – people are more likely to be willing to pay more for a unique or interesting experience. A spectacular architectural masterpiece with a metal dragon on the chimney – also includes a staircase carved from an actual tree trunk. 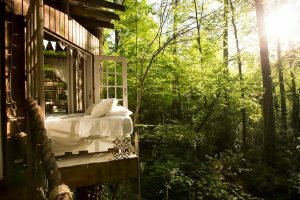 A magical-looking treehouse set in the trees, with a large balcony attached. Don’t let the rustic looking outside deceive you though; inside is fitted out like a luxury hotel with full sized beds and a proper dining area! 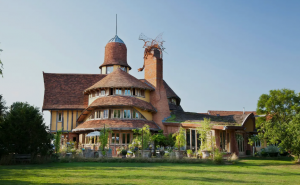 Looking not too dissimilar from something you’d find in a children’s picture book, the top-heavy ‘House in the Clouds’ was originally a water tower and was converted into a holiday let with no less than five double bedrooms. Or… a property which has something unusual or extra special inside? 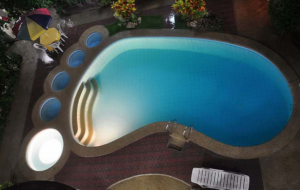 This particular apartment rental offers a swimming pool which is shaped like a footprint (apparently ‘in honour’ of the apartment owner’s fashion brand). In this holiday let, not only can you enjoy the treehouse format, but also the added functionality to be found in hitching your bed out under the stars, in the open air! Or… a property which is recognisable or iconic in some way? 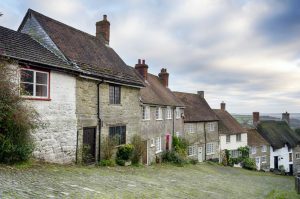 Iconic Shaftesbury cottages on Gold Hill are actually available to buy from time-to-time. The idyllic-looking cobbled street the cottages are situated on was the setting for the famous (and much beloved) Hovis advert of the 1970s; against the backdrop of what was meant to portray a northern industrial town (despite actually being situated in Dorset). To this day, the cottages on this street are still used on Christmas cards, chocolate boxes and calendars. It’s a slice of quintessential English life, and to that end, a great place to invest in a property! There are a couple of self-catering holiday cottages to rent on Gold Hill which are very popular – including UpDown Cottage (you only have to look at their booking calendar to see how popular they are…). This cottage inspired one of the main locations used in the 2006 Christmas romantic movie ‘The Holiday’ (starring Cameron Diaz and Jude Law). It is extremely alike to Kate Winslet’s character Iris’ home in the 2006 film. In fact, the producers used Honeysuckle Cottage as the basis for Kate Winslet’s character Iris’s home. This resulted in a specially-designed set being developed for the movie, with many of the same interior and exterior features included. In December 18 the property was on the market for £650,000. An ideal holiday let investment! Savvy owners of properties featured on the show are renting them out as holiday lets. One example is The Rockhouse Retreat (featured in the show 2015), a cave house carved into an 800-year-old rock in the Wyre Forest in Worcestershire. The unique property is rented out for £245 per night – three times the price of other properties in the same area! It may be that your first thought is to try searching on well-known property websites like Zoopla and Rightmove – however, trying to find the types of property we’ve been exploring in this blog might be a bit like trying to find a needle in a haystack. These sites offer regular and conventional properties in the main, and it’s not easy to filter out the more unusual listings to view. Fear not though. There are several other websites you can visit which are either run by property enthusiasts and include up-to-date listings, or specialist estate agent sites which focus primarily on selling very niche properties. Here are just a few of the websites we’ve found that might help you. They list unique and unusual properties for sale (or offer a service dedicated to finding these kinds of properties for you – depending on your requirements). 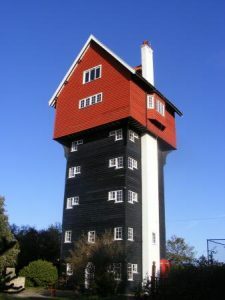 Unusual Homes advertises a wide range of unusual property and unique homes for sale, including; castles, railway conversions, stately homes, windmills, and much more. Unique Home Stays offer a property service which focuses on finding your perfect out-of-the-ordinary property to buy; often in great locations. Waterside Properties specialise only in marina, coastal, riverside and waterfront homes. Period Property is a website where you can search for thatched cottages, medieval manor houses and historic homes for sale. The Modern House lists modern, design-led homes for sale in urban and rural locations in the UK. The Unique Property Bulletin lists the latest unusual properties for sale. You can also find properties by looking out for PR articles that list unique holiday lets or Airbnb rentals. Once you have found a suitable property see if they have their own website or are listed with a holiday cottage letting agents. You can then contact them to ask if the property is open to offers – you never know until you ask! Ready to explore the options? So, if we’ve inspired you to have a serious think about either adding something different to your property portfolio or strike out with an exciting first holiday home purchase – remember – the possibilities are endless in terms of the kind of building or setting you can purchase to delight and impress your future guests! On a final note, unless the unique holiday rental you invest in is already established with healthy bookings, I would let it through a holiday cottage agency when starting out. They have the expertise and media connections to make the most of PR opportunities that arise, which means more eyeballs and potential bookings for your rental. 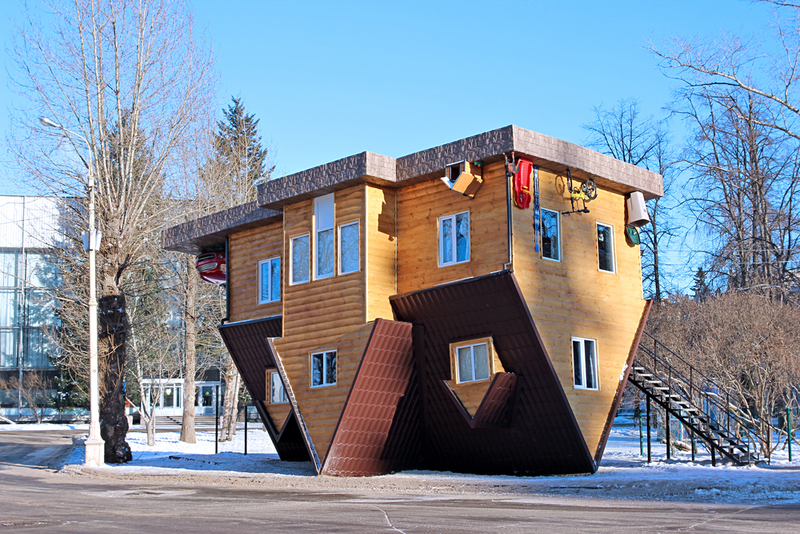 Looking to insure a unique holiday home?